This monograph thoroughly discusses the composition and clinical use of hemodialysate. Knowledge of the fundamental principles regarding the preparation and clinical applications will help the reader provide better care to the End Stage Renal Disease (ESRD) patient. The graphics in this monograph are in full color. Thirty (30) contact hours are awarded for continuing education upon completion of this monograph post test. $120.00 plus $ 15.00 S & H. - California Residents please add 10.25% State tax to purchase price. 2. Request not covered under �Regular Orders� information. An additional charge of fifty dollars ($50.00) is added for any order requiring FedEx mailing of any document. If both the surcharge handling and special mailing by FedEx are required, the total additional charge is one hundred dollars ($100.00). This monograph describes the machinery and personnel monitoring of the hemodialysis process. It is an in-depth review of hemodialysis safety monitors, covering both blood and dialysate circuits. Most if not all information is obtained from clinical research and actual hemodialysis experience. Expert and seasoned MDs and RNs in the ESRD field have reviewed all. We are proud to add this vital information to our list of publications. The cover is a full-color graphic covered with water-resistant, laminated plastic. The monograph is bound with a spiral of brilliant blue anodized aluminum. The monograph content is nonpareil. Thirty (30) contact hours are awarded for continuing education upon completion of this monograph post test. This monograph is the definitive reference for blood elements in end stage renal disease (ESRD). Also covered are anticoagulant therapy, heparin, erythropoietin therapy and many of the complications associated with accessing the arterial and venous blood compartments of the human body. This monograph contains medical and nursing material unavailable in other single medical, nursing, or technical book. There are over 70 graphics, formulas, tables and a posttest. A vital and necessary glossary of ESRD terms is included. A classic! Thirty (30) contact hours are awarded for continuing education upon completion of this monograph post test. $120.00 plus $ 15.00 S & H - California Residents please add 10.25% State tax to purchase price. 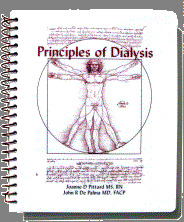 This monograph, recently updated to the 3rd edition, covers acute and chronic renal failure, principles of hemodialysis, application of diffusion and ultrafiltration, dialysate solution, dialyzers, the hemodialysis system, the hemodialysis prescription, dialysis dose, access to the circulation, anticoagulation therapy, and alternative therapies. It also includes glossary of terms and more than 100 illustrations, formulas, graphs, tables, and a posttest. Thirty (30) contact hours are awarded for continuing education upon completion of this monograph post test. $120.00 plus $15.00 S & H - California Residents please add 10.25% State tax to purchase price.